Garth Ennis unleashes his next major epic in the vein of Preacher, but this-time, hes taking it up a notch! 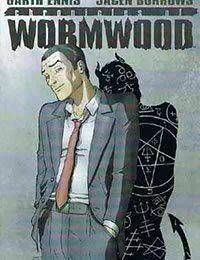 Wormwood is the anti-Christ, no way around it, his dad is Satan and his demonic powers help him fit right into New York. His best friend is Jesus, who is a black, mentally-challenged, man that just isnt performing many miracles these days. The pesky Armageddon is coming right up, and it doesnt look like Pope Jacko is going to be any help in stopping it. Ennis drags the whole world into the gutter with his trademark razor-sharp dialogue, biting wit, and the stunning art of Jacen Burrows, all in full-color. The Chronicles of Wormwood is an on-going series of series that launches this summer!